Slow Camper : On Piste and piste off. On Piste and piste off. Leaving the edge of the Sahara and driving back across the High Atlas, internet access has been non-existent. I wrote this at 2300 metres in the High Atlas at the Tizi n’Tazazert Pass, maybe suffering from altitude sickness. We left our lovely small campsite in Zagora (where there were 3 Unimogs camped!) and went ‘off road’, known as a ‘piste’ here to cross the High Atlas at the Tizi n’Tazazert. The piste started off quite rough and then got worse, then it deteriorated and then it got worse. Really it is the worst road I’ve been on and Lawrence has commented that it was the worst drive he’s ever undertaken, more like a goat track. Hats off to Lawrence for driving it without killing us or any goats (round of applause for Lawrence here please), really he was amazing, but spare a thought for me – I had to do all the backseat driving. On one of the highest nastiest pieces there was one man with a pick mending the road – this was not a comfort. It took us 3 hours to do the last 40kms. On Piste (this was a good bit) and Piste Off... The books flew out of the bookshelf!!! Describing the landscape is really beyond my literary skills, it is so dramatic, almost like some artistic giant has sculptured it with an enormous trowel. It is also barren, harsh and inhospitable. You wouldn’t want to break down here. We couldn’t really appreciate the scenery so well because I was scared we were about to become a part of it. I could see the next travellers – “Ooh what’s that yellow speck way down in the ravine?” I’ve tried to capture it all on photo but the really rough parts of the piste couldn’t be photographed because we couldn’t stop and it was too rough for mogcam photography. The photos can’t really do it justice. Finally we arrived at the highest point to be greeted by people trying to flog us stuff – where did they come from at 2600+ metres???? Anyway there was a VERY rustic “Auberge” near the top. I think they have one room for rent and you can have an omelette or an omelette, which we devoured gratefully straight out of the pan. The photo illustrates the toilet much better than I could describe it!! The Dog wondered where his G&T was. We parked on the edge of a cliff and quaffed our G&T at sunset, accompanied by a dog. How do I attract them? I think the word has spread about the dog blog. 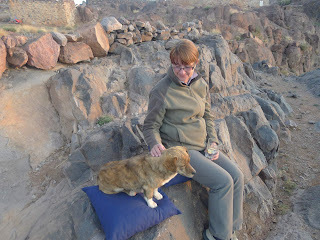 This is a really remote area, but the dog wanted to sit next to me, commandeering Lawrence’s cushion. 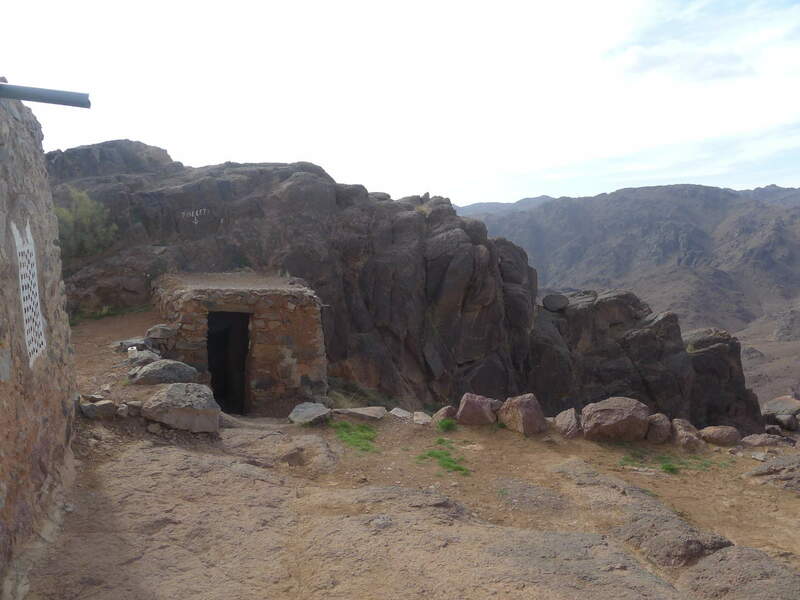 We left Tizi n’Tazazert quite early not knowing what was in front of us. We only did 30kms on the dirt before wimping out once we hit the black top. We could have crossed this road for more punishment on the piste, but the roll bars on the mog were rattling like nobody’s business and needed attention, not more roughing up. We limped into Tinerhir and found some wonderful mechanics, who sized up the problem, worked out the solution and got straight to work. They had to remove one of the fuel tanks and God knows what to weld the roll bars back onto the chassis. They did a fantastic job in about 4 hours flat. It cost just over 100 euros. That night at dinner we met some great fun American guys who were travelling across Morocco on big BMW road bikes. One of them was fascinated with the Mog. They had the grand tour in the morning, and crawled all over it. I tried to sell it, but no go! 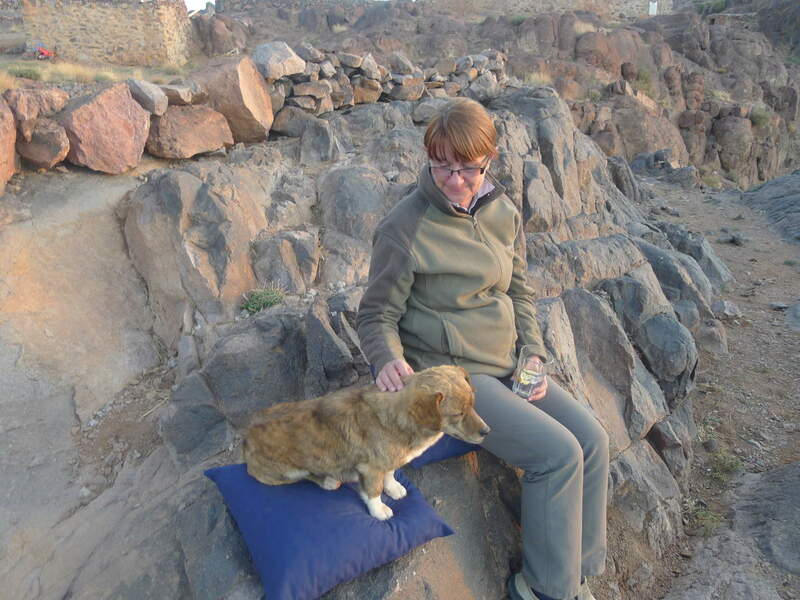 We drove through the Todra Gorge next day with them and then sadly waved them goodbye. Ewen and Charley? No! Bob and Randy. 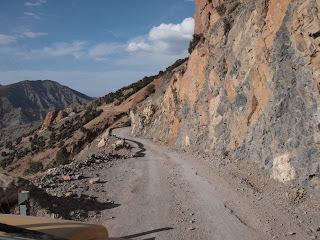 We drove through Todra Gorge which was of course amazing, but to me looked very much like the Kimberely – but maybe on a bigger scale. Coming out of the gorge, the landscape was incredible, ever changing, dramatic, barren but with fertile valleys, which were cleverly irrigated to make the most of the water. Our lunch stop at Camping/Auberge Ibrahim was sensational, one of the best meals we’ve had. If it had been later in the day we would have been happy to stay. It was a really lovely spot, clean, neat and friendly. We met another American, Ryan, who was doing 2 years in this remote spot working with the Peace Corps. We camped in a gravelled area that night, as I was spooked by the lovely place by the lake. You know how sometimes somewhere will give you the heebie jeebies??? Poor Lawrence had to drive an extra hour and a half on a really bad, steep, winding road, then find a place without the local urchins begging for money and pens. Easy day into Azrou. This is an Alpine style town with a ski area nearby, the steep pitched roofs look strange after the flat roofed mud brick villages across southern Morocco. More work needed on the Mog. Once again we have been blessed by fantastic mechanics, who came to the camp, took the exhaust pipe away, repaired it and are now fixing it back to the truck at 8pm. All this whilst we ate our Mog delivery tagine. We bought our own tagine today at a local souk. Cost a whole 4 euros. Please send recipes. Spain beckons… we just need to cross the Rif without being hijacked by the local drug gangs, and we’ll be back at Tanger Med and across the sea. Lawrence, what was the tyre pressure while you were on the pist? it should have been no more than 2 bar. if.. and only if you were travelling with normal road pressure you're lucky you didn't dismantle the whole truck.